September 8, 1973 – Led by the Reverend Jesse Jackson, more than 8,000 people march through the Loop from a starting point at State Street and Wacker Drive, headed for a rally in Grant Park. A spokesman for the Coalition for Jobs and Economic Justice, the sponsor of the march, says, “We are facing a crisis of everyday living. It is the story of the jobless at the employment gate. It’s 40 million school children facing the loss of milk. It’s the crisis of the welfare mother trying to fend off malnutrition at supermarket prices, the closed down factory, the bus line that died.” [Chicago Tribune, September 9, 1973] Jack Edward, the Vice-President of the United Auto Workers says at the Grant Park rally, “In 1963 we had a friendly wind at our backs—John F. Kennedy. Now we have adversity at our faces—Richard M. Nixon, whose interest in economic and social justice was clearly demonstrated by his veto this week of a bill that would have raised the minimum wage in steps to $2.20 an hour and extended the protection of the Fair Labor Standards Act to about 7 million workers.” Organizers had predicted a turn-out of 50,000 protestors, an estimate that was clearly optimistic. 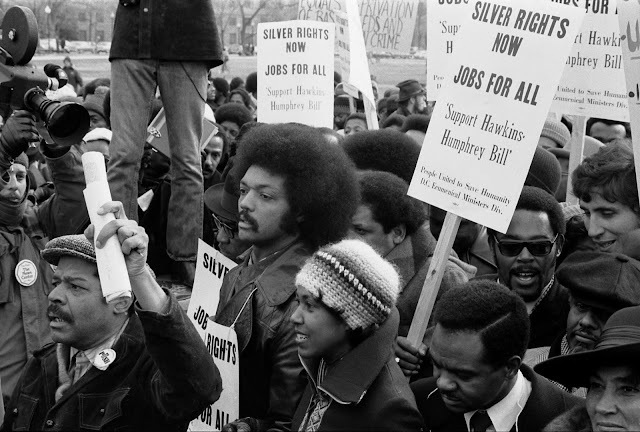 As the above photo shows Reverend Jackson is still at it in 1975 as he leads a rally in favor of the Humphrey-Hawkins act that advocated using government-paid positions to combat the ravages of inflation and unemployment. September 8, 1860 – The schooner Augusta sails into Chicago, reporting that sometime during the night she had collided with the Lady Elgin on the lake. 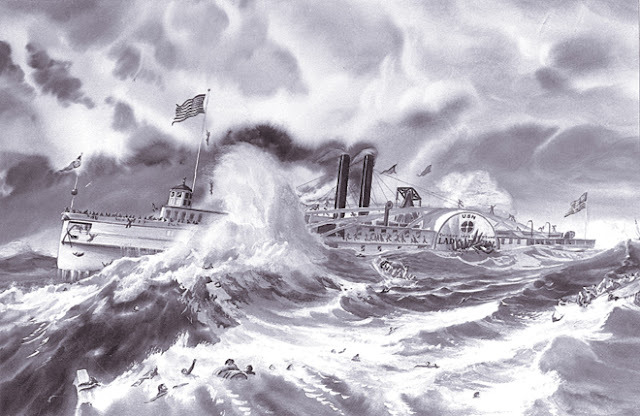 The Lady Elgin, with somewhere between 400 and 700 passengers aboard, most of them members of Milwaukee’s Irish Union Guard, is holed below the waterline when the Augusta strikes her amidships in the midst of a lake squall, and within 20 minutes she sinks. No one will ever know how many drown in the lake off Winnetka or die on the rocks just off shore. Bodies continue to wash ashore well into December, some of them almost 80 miles from the wreck. Many of those aboard the Lady Elgin are never found. Those who could be identified are returned to Milwaukee for burial, but a number of the unfortunate souls onboard the ship are buried in a mass grave In Highwood, not far from the Port Clinton lighthouse, a place that has since been lost to time.